The S&P 500 was on its way to a second, consecutive winning week, but came up short as a weak Eurozone manufacturing report renewed concerns over a global economic slump. The news reversed an upbeat mood following the Federal Reserve’s announcement on Wednesday that it was unlikely to hike interest rates in 2019. The Fed’s message provides support for the U.S. economy amid weakness accelerating abroad. This week’s main economic report showed that U.S. homebuyers remain undeterred by slowdown concerns. Supported by a strong labor market and healthy wage gains, existing home sales climbed double digits in February. For the week, however, the S&P 500 shed -0.77%. The Eurozone manufacturing sector continued to take a beating, dropping to 47.7 in March from 49.4 in February according to IHS Markit. Numbers above 50 indicate expansion in the manufacturing sector, while numbers below 50 indicate contraction. The latest report indicates a deepening recession for the Eurozone manufacturing sector as new orders posted their sharpest decline since December 2012. The drop in the new orders component was fueled by the largest decline in new export orders since August 2012. At the country level, the Eurozone’s global export powerhouse Germany saw its manufacturing plummet, falling to 44.7 in March from 47.6 in February. That was the manufacturing sector’s lowest reading in over six-and-half years. The country also took a beating from a decline in new exports orders as clients remained on the fence in placing new orders amid high uncertainty over the U.S.-China trade dispute. There is no sugar coating this report. It was not good and there is no immediate end in sight given the uncertainty that remains with the Brexit deadline having been delayed by two weeks (from March 29th to April 12th) and so long as global trade disputes remain. In a move widely anticipated by markets, the Federal Reserve signaled at its Federal Open Market Committee Meeting that it will not hike interest rates again this year. For 2020, the central bank is currently penciling in a single rate hike. The announcement means that the benchmark interest rate will remain in a range between 2.25% and 2.50% and help keep benchmark lending rates low for the foreseeable future. In addition to keeping direct lending rates low, markets also cheered the central bank’s announcement that it would slow the pace at which it is shrinking its $4 trillion asset portfolio. It plans to end the runoff of its Treasury holdings at the end of September. The move to end its portfolio runoff combined with no rate hikes for 2019 should help ease financial conditions as the global economy remains weak. In some positive news for the U.S. economy, consumers flush with holiday bonuses and bigger paychecks pushed existing home sales up 11.80% in February to a seasonally adjusted annual rate of 5.51 million. That was the biggest monthly increase since December 2015. February’s strong gains were primarily driven by single-family home sales which rose 13.3% to a 4.94 million pace amid strong gains in the South and West. The jump in sales came despite a 3.60% year-over-year increase, which pushed the median sales price to $249,500. A strong jobs market combined with the Fed remaining on the sidelines for 2019 means that 2020 should most likely keep mortgage rates low and support a healthy spring homebuying season. The late week sell-off rattled investors, who are waiting to see if recent central bank moves will be enough to engineer a soft landing. Earlier this month, the European Central Bank made a proactive move by announcing a fresh round of stimulus to help boost the flagging economy. Although the stimulus should help provide some support for the economic bloc, there are still some basic impediments standing in the way. Companies continue to be handcuffed by Brexit. A final deal has yet to be brokered as Britain’s Parliament continues to squabble over details over an exit agreement to leave the economic bloc. Fortunately, the European Union has extended Britain’s departure date which should give the U.K. more time to finalize a deal, but the outcome and implications are anything but certain. In the U.S., the Federal Reserve has basically reverted to the policies of Yellen and Bernanke. No rate hikes in 2019 and most likely no rate hikes in 2020 take monetary policy off the list of market concerns, leaving investors to just sweat the economy, trade and earnings. Fortunately, the U.S. consumer remains relatively strong as evidenced by this week’s strong existing home sales report, but while the number of economists predicting a U.S. recession remain in the minority, headwinds are certainly present. A light week for economic news with housing starts and the second estimate of Q1 U.S. GDP being the highlights of the week. Tax season is in full swing with the April 15th deadline a little more than three weeks away. This week, the IRS completed its annual “Dirty Dozen” list of tax scams for 2019 to warn taxpayers about fraudulent tax schemes. The agency highlighted one scam per day on 12 consecutive weekdays to raise awareness and help taxpayers protect themselves and their personal information. 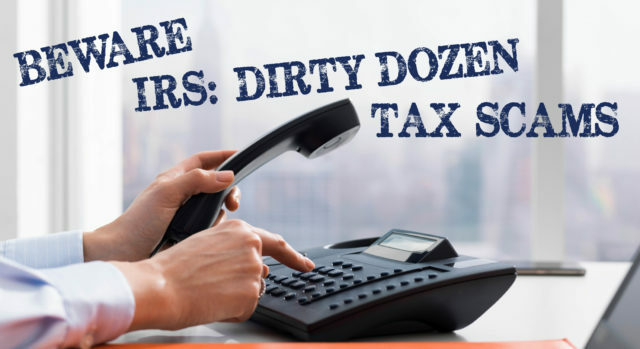 Below is a recap of the 2019 Dirty Dozen from the IRS. 1. Phishing: Phishing is a type of online scam where criminals send emails purported to be from reputable companies in order to induce individuals to reveal sensitive personal information, such as passwords and credit card numbers. The IRS will never initiate contact with taxpayers via email about a bill or tax refund. The IRS warns taxpayers to not click on emails claiming to be from the IRS and to be wary of emails and websites that may be nothing more than scams to steal personal information. 2. Phone Scams: Almost 2.5 million Americans have been targeted by IRS impersonators in recent years who may demand money or may say you have a refund due and try to obtain personal information. These con artists often threaten taxpayers with police arrest, deportation, and license revocation, among other things. The IRS will never call to demand immediate payment, threaten you, or require you to use a specific payment method such as a prepaid debit card. 3. Identity Theft: Tax-related identity theft is when someone uses a stolen Social Security number to file a return with false income data in an attempt to trick the IRS into providing a refund. 4. Return Preparer Fraud: The vast majority of tax professionals provide honest, high-quality service. Preparer fraud may happen when someone posing as a qualified tax representative files your taxes and keeps your return. In some cases, the preparer may inflate your taxes with credits and deductions for which you may not qualify. 5. Inflated Refund Claims: Taxpayers should take note of anyone promising inflated tax refunds. Those preparers who ask clients to sign a blank return, promise a big refund before looking at taxpayer records, or charge fees based on a percentage of the refund are probably up to no good. To find victims, fraudsters may use flyers, phony storefronts, or word of mouth via community groups where trust is high. 6. Falsifying Income to Claim Credits: Con artists may convince unsuspecting taxpayers to invent income to erroneously qualify for tax credits, such as the Earned Income Tax Credit. The IRS advises taxpayers to file the most accurate tax return possible because the taxpayer is legally responsible for what is on their return. Falsifying income can lead to taxpayers facing large bills to pay back taxes, interest, and penalties. 7. Falsely Padding Deductions on Returns: Taxpayers should avoid the temptation to falsely inflate deductions or expenses on their tax returns to pay less than what they owe or to potentially receive larger refunds. Think twice before overstating deductions, such as charitable contributions and business expenses, or improperly claiming credits. 8. Fake Charities: Groups masquerading as charitable organizations solicit donations from unsuspecting contributors. Beware of charities with names similar to familiar or nationally-known organizations. Contributors should take a few extra minutes to ensure their hard-earned money goes to legitimate charities. 9. Excessive Claims for Business Credits: Avoid improperly claiming the fuel tax credit, a tax benefit generally not available to most taxpayers. The credit is usually limited to off-highway business use, including use in farming. Taxpayers should also avoid misuse of the research credit. Improper claims often involve failures to participate in or substantiate qualified research activities or satisfy the requirements related to qualified research expenses. 10. Offshore Tax Avoidance: Successful enforcement actions against offshore cheating show it’s a bad bet to hide money and income offshore. The IRS states on its website that people involved in offshore tax avoidance are best served by coming in voluntarily and getting caught up on their tax-filing responsibilities. 11. Frivolous Tax Arguments: Frivolous tax arguments may be used to avoid paying tax. Promoters of frivolous tax schemes encourage taxpayers to make unreasonable and outlandish claims about the legality of paying taxes despite these types of cases being repeatedly thrown out in court. 12. Abusive Tax Shelters: Abusive tax structures are sometimes used to avoid paying taxes. The vast majority of taxpayers pay their fair share, and everyone should be on the lookout for people peddling tax shelters that sound too good to be true. When in doubt, taxpayers should seek an independent opinion regarding complex products they are offered. You can read more about the Dirty Dozen on the IRS website here.